But I have heard that it has side effects on sensitive skin. I am really concerned, and very confused as I don't have any other option. Can you tell me if it is a safe option? If not, then what else can I do? 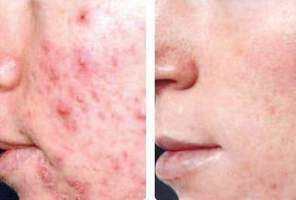 Is isotretinoin a steroid tablet? I'm in the first trimister of my pregnancy and have acne. I bought a neutragena blue light therapy mask. Can I use it without harming the baby? I want to be sure before using blue light therapy on my acne during pregnancy. Regardless of whether I pop my pimples or not, a scar is still left behind. How can I prevent scarring? What's the right way to treat a pimple? Is it necessary to see a dermatologist for acne/pimples, or is there an at-home treatment you can recommend? What's the best form of acne treatment for my skin? I'm 22 years old. I have a lot of acne on my face and it's causing some holes and marks. As a result, my skin is aging and I'm looking older than my age. The problem may lie in my skin, which is oily. What should I do? What acne treatment would you recommend?